5/22: Fully stocked kitchen with all dishes, flatware, pots, pans, etc. 6/22: Fully stocked kitchen with all dishes, flatware, pots, pans, etc. Property Size 725 sq. ft. This beautfully decorated one bathroom with a loft is the perfect space for your next family vacation! This well appointed unit has the master bedroom with a king bed downstairs with a full bathroom. A second bathroom with a tub and shower is located downstairs in the hall. You will get all your cooking needs in with this newly renovated kitchen with all stainless steel appliances. The kitchen is fully stocked with everything you will need to make this a wonderful vacation while having that feeling of home. In the living room we have a split air conditioner (much more powerful than a window unit) that cools the entire unit. 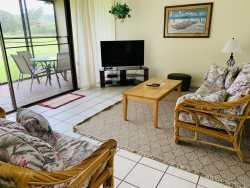 On the screened in lanai you will find a dining table and chairs where you can have meals with fantastic mountain and golf course views. Upstairs we have two queen beds for a cozy nights sleep after your long days at the beach. This unit is not located on the ground floor. There is a washer/dryer in the unit and all units come with free WiFi access. Condo is fully stocked with linens, towels and all kitchen needs such as a coffee maker, blender, dishes, pots, pans, etc. One off street, secure parking space is included. Within walking distance you can choose between three pools, a tennis court, two world-class golf courses at Turtle Bay Resort, fine dining restaurants, amazing beaches, surfing, horseback riding, and a beautiful spa. 10 minute drive to Sunset Beach, Pipeline, Waimea Bay and Valley and Shark’s Cove. 20 minute drive to the town of Hale’iwa where you can find great restaurants, shopping and adventure tours like Shark Tours, jet-ski rentals, and scuba diving. 10 minute drive to BYU and Polynesian Cultural Center. No smoking/no pets allowed. Unit is NON ADA compliant. I loved the unit. Great location. Perfect for my family staying for 9 days. We enjoyed having the kitchen, we cooked everyday. Manager Response: Jessica, thank you for choosing to stay with us! We love to hear about guests experiences in the units. I agree that the convenience of having a fully stocked kitchen can make your vacation! We hope you can return soon.